نقاط کوانتومی (نانوبلورهای نیمه هادی) و سیستم های هسته پوسته تهیه شده از آنها از جمله موادی هستند که امروزه بسیار مورد توجه قرار گرفته اند. 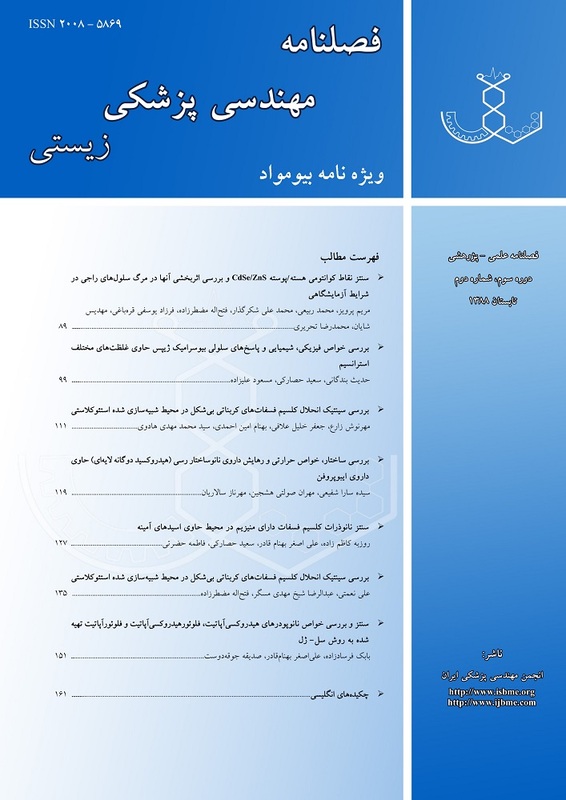 از میان این دسته از مواد نقاط کوانتومی کادمیم سلناید (CdSe) به تنهایی و یا به همراه پوسته ای از سولفاید روی (ZnS)، به دلیل پایداری نوری، بازدهی لومینسانس بالا و دامنه وسیعی از بازتاب آن هم در محدوده نور مرئی، مورد توجه ویژه در برخی کاربردهای مهندسی پزشکی هستند. در این تحقیق نقاط کوانتومی CdSeزیست سازگار و محلول در آب با روشی ساده و ارزان با استفاده از عامل بازدارنده ژلاتین سنتز شده است و سپس پوششی از ZnS به روش رسوبی بر روی آن قرار گرفته است. خواص نوری این نقاط با اندازه گیری میزان فوتولومینسانس ناشی از آنها بررسی شده است و زیست سازگاری آنها تا غلظت 200 mg/mlit با استفاده از تحلیل نتایج آزمون MTT تائید شده است. با قرار دادن گروه های مرکاپتو ساکسینیک اسید بر روی سطح این نقاط علاوه بر افزایش پایداری آنها در محیط آبی، سطح با گروه های کربوکسیلیک عاملدار شده است. این گروه ها در مجاورت گروه های آمینی آنتی بادی CD20، پیوند های آمیدی تشکیل داده است. به منظور بالا بردن بازده فرایند اتصال آنتی بادی ها به سطح نقاط کوانتومی از 1- اتیل-3-[3- دی متیل آمینو پروپیل] کربودی آیماید هیدروکلراید و هیدروکسی سولفوساکسین آیماید استفاده شده است. نتایج آزمون PAGE، افزایش kDal20 در وزن آنتی بادی ها را نشان می دهد که بیانگر کانژوگه شدن این پروتئین ها با نقاط کوانتومی مذکور است. غلظت های مختلف نقاط کوانتومی بیوکانژوگه شده در مجاورت سلول های رده لنفوئیدی B (راجی) قرار داده شده اند و با اعمال تابش در محدوده 400 nm (فرابنفش) در بازه های زمانی مختلف اثر لومینسانس حاصل از این نقاط کوانتومی بر مرگ سلول ها بررسی شده است. A great deal of attention has been drawn to the colloidal chemistry based semiconductor nanocrysallites, also known as quantum dots (QDs). Because of the strong quantum confinement, quantum dots have unique size-dependent optical properties, which are much more superior to the conventional organic fluorescence materials. In addition, strong chemical resistant makes inorganic semiconductor QDs an ideal candidate for next-generation of bio-labels and other biomedical applications. This study presents a synthesize method of high quality biocompatible CdSe QDs in aqueous solution by using gelatin as inhibitor. A thin ZnS layer was grown on CdSe QDs, forming a CdSe/ZnS core/shell structure, to improve the photoluminescence. The optical properties of the QDs were characterized by photoluminescence spectra. The stability of CdSe/ZnS QDs in aqueous solution has been improved with capping in mercaptosuccinic acid (MSA) groups. PAGE test results show that carboxylic groups of MSA have interacted with NH2 agent of CD20 antibodies. We evaluate the in vitro efficiency of the luminescence of the bioconjugated QDs to kill Raji cells. Raji cells have anti-CD20 which can especially connect to CD20-QDs. In conclusion, we found that CD20-CdSe/ZnS bioconjugated QDs with different concentration 50-250 µg/mL which have been exited at 400nm in 2h intervals can result in Raji cells death. This study shows the potential of CdSe/ZnS for cancer treatment. Qiangbin W., Yang X., Xiaohang Z., Yung C., Yan L., Lijinig J., Jaswinder S., Dong-Kyun S., Hao Y.; A Facile one-step in situ Functionalization of Quantum dots with preserved photoluminescence for bioconjugation, J. Am. CHEM. Soc., 2007; 129: 6380- 6381. Dybiec M., Chomokur G., Ostapenko S., Wolcott A., Zhang J. Z., Zajac A., Phelan C., Sellers T., Gerion G., Photoluminescence spectroscopy of bioconjugated CdSe/ZnS quantum dots, Appl. Phys.Lett., 2007; 90: 26311-26312. Gerion D., Pinaud F., Williams S. C., Parak W. J., Zanchet D., Weiss S., Alivisatos A. P., Synthesis and Properties of Biocompatible Water-Soluble Silica- Coated CdSe/ZnS Semiconductor Quantum Dots, J. Phys. Chem., B. 2001; 105: 8861–8871. Lee C. W., Chou C. H., Huang J. H., Hsu C. S., Nguyen T. P., Investigations of organic light emitting diodes with CdSe (ZnS) quantum dots, Mater. Sci. Eng., B. 2008; 147: 307-311. Hardman R., A toxicologic review of quantum dots: toxicity depends on physicochemical and environmental factors, Environ Health Perspect., 2006; 114: 165–172. Jovin T.M., Quantum dots finally come of age”, Nat Biotechnol, 2003; 21: 32–33. Lee J., Sundar V.C., Heine J.R., Bawendi M.G., Jensen K.F., Full Color Emission from II-VI Semiconductor Quantum Dot Polymer Composites, Advanced Materials. 2000; 15: 1102-1105. Boatman E. M., Lisensky G. C., A safer, easier, faster synthesis for CdSe quantum dot nanocrystals, J Chem Educ., 2005; 82: 1697–1699. Chen W., Sun X. K., Luminescent nanoparticles for biological applications: Imaging, therapy, and targeting strategies, In: Chen X., editor, Recent Advances of Bioconjugation Chemistry in Molecular Imaging, Research Signpost; Kerala: (in press). Medintz I. L., Uyeda H. T., Goldman E. R., Mattoussi H., Quantum dot bioconjugates for imaging, labelling and sensing, Nat. Mater., 2005; 4: 435-446. Schooss D., Mews A., Egchmuller A., Weller H., Quantum dot quantum well CdS/HgS/CdS: theory and experiments, 1994; 49: 17072-17078. Chestnoy N., Harris T. D., Hull R., Brus L. E., Luminescence and Photophysics of CdS Semiconductor Clusters: The Nature of the Emitting Electronic State, J. Phys. Chem., 1986; 90: 3393-3399. Wang Q., Iancu N., Seo D. K., Preparation of Large Transparent Silica Monoliths with Embedded Photoluminescent CdSe@ZnS Core/Shell Quantum Dots, Chem. Mater., 2005; 17: 4762-4764. Anas A., Akita H., Harashima H., Itoh T., Ishikawa M., Biju V., Photosensitized Breakage and Damage of DNA by CdSe−ZnS Quantum Dots, J. Phys. Chem., 2008; 112: 10005–10011. Pass H. I., Lott D., Leonardo F., Asbestos Exposure, Pleural Mesothelioma, and Serum Osteopontin Levels, New Engl. J. Med., 2005; 353: 1564-1573. Kuno M., Fromm D. P., Hamann H. F., Gallagher A., Nesbitt D. J., "On"/"off" fluorescence intermittency of single semiconductor quantum dots, J. Chem. Phys., 2001; 115: 1028-1037. Tran P. T., Goldman E. R., Anderson P. G., Mauro J. M., Mattoussi M. H., Application of luminescent CdSe-ZnS quantum dot bioconjugates in immuno- and fluorescence-quenching assays, Nanoscience Using Laser-Solid Interactions conference., 2002; 4636: 23- 25. Dabbousi B. O., Rodriguez V. J., Mikulec F. V., Heine J. R., Mattoussi H., Ober R., Jensen K. F., Bawendi M. G., (CdSe)ZnS Core−Shell Quantum Dots: Synthesis and Characterization of a Size Series of Highly Luminescent Nanocrystallites, J.Phys. Chem. B. 1997; 101: 9463-9475. Peng X., Schlamp C. M., Kadavanich A. V., Alivisatos A. P., Epitaxial Growth of Highly Luminescent CdSe/CdS Core/Shell Nanocrystals with Photostability and Electronic Accessibility, J. Am. Chem. Soc., 1997; 119: 7019-7029. Jiang S., Gnanasammandhan M. K., Zhang Y., Optical imaging-guided cancer therapy with fluorescent nanoparticles, J. R. Soc. Interface. 2010; 7: 3–18. Atri M., New technologies and directed agents for applications of cancer imaging, J. Clin.Oncol., 2005; 24: 3299–3308. Carter J D., Cheng N. N., Qu Y., Suarez G. D., Guo T., Nanoscale energy deposition by X-ray absorbing nanostructures, J. Phys. Chem, B. 2007; 111: 11622- 11625. Ling X., Kunji C., Hatimmonemced E. L. K., Minghai L., Xinfan H., Enhancement of band-adge luminescence and photo stability in colloidal CdSe quantum dots by various surface passivation technologies, Appl. Surf.Sci., 2001; 172: 84-88. تکمه داشی حسن، اوسطی آشتیانی فرزانه، پورفتح‌اله علی اکبر، مقایسه اثر روی(Zn) بر زنده ماندن و شکل ظاهری سلول های رده لنفوئیدی Raji وMolt-4، مجله دانشگاه علوم پزشکی گیلان، 1383، 13: 32-37.